After three seasons of below-average rainfall, the people of central Somalia are beginning to fear the worst. Safia Ali, mother of five, has not eaten in seven days. Her 1-year old son, Farhan, has fallen ill. The result is that Ms. Safia, a 25-year-old mother of five, has not eaten in a week. Her 1-year-old son is starving too, an adorable, listless boy who doesn’t even respond to a pinch. Somalia — and much of the volatile Horn of Africa, for that matter — was about the last place on earth that needed a food crisis. Even before commodity prices started shooting up around the globe, civil war, displacement and imperiled aid operations had pushed many people here to the brink of famine. But now with food costs spiraling out of reach and the livestock that people live off of dropping dead in the sand, villagers across this sun-blasted landscape say hundreds of people are dying of hunger and thirst. This is what happens, economists say, when the global food crisis meets local chaos. “We’re really in the perfect storm,” said Jeffrey D. Sachs, a Columbia economist and top United Nations adviser, who recently visited neighboring Kenya. There has been a collision of troubles throughout the region: skimpy rainfall, disastrous harvests, soaring food prices, dying livestock, escalating violence, out-of-control inflation, and shrinking food aid because of many of these factors. Across the border in Ethiopia, in the war-racked Ogaden region, the situation sounds just as dire. 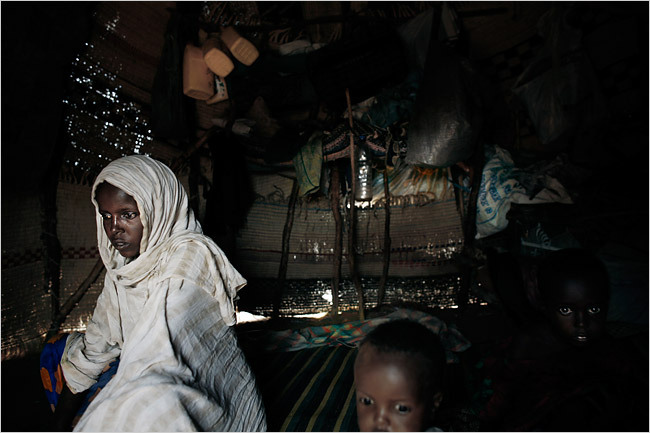 In Darfur, the United Nations has had to cut food rations because of a rise in banditry that endangers aid deliveries. Kenya is looking vulnerable, too. Many Somalis are trying to stave off starvation with a thin gruel made from mashed thorn-tree branches called jerrin. Some village elders said their children were chewing on their own lips and tongues because they had no food. The weather has been merciless — intensely hot days, followed by cruelly clear nights. This week, Saida Mohamed Afrah, another emaciated mother, left her two children under a tree and went scavenging for food and water. When she came back two hours later, her children were dead. She had little to say about the drought. “I just wish my children had died in my lap,” she said. The United Nations has declared a wide swath of central Somalia a humanitarian emergency, the final stage before a full-blown famine. But Christian Balslev-Olesen, the head of Unicef operations in Somalia, said the situation was likely to become a famine in the coming weeks. Famine is defined by several criteria, including malnutrition, mortality, food and water scarcity and destruction of livelihood. Some of those factors, like an acute malnutrition rate of 24 percent in some areas of Somalia, have already soared past emergency thresholds and are closing in on famine range. Mr. Balslev-Olesen said Unicef recently received reports of people dying from hunger and thirst. It is hard to know exactly how many, he said, though local elders have put the number in the mid-hundreds. Many people already consider Somalia a catastrophe. It has some of the highest malnutrition rates anywhere in the world — in a good year. The collapse of the central government in 1991 plunged Somalia into a spiral of clan-driven bloodshed that it has yet to pull out of. The era began with a famine that killed hundreds of thousands of people. The consensus now is that all the same elements of the early 1990s — high-intensity conflict, widespread displacement and drought — are lining up again, and at a time of the biggest spike in global food prices in more than 30 years. The United Nations says 2.6 million Somalis need assistance and the number could soon swell to 3.5 million, nearly half the estimated population. If there is excellent rain or a sudden peace, the crisis may ease. But weather projections and even the rosiest political forecasts do not predict that. Whether Somalia slips into a famine may depend on aid, and right now, that does not look so good either. Eleven aid workers have been killed this year, and United Nations officials say Somalia is as complicated — and dangerous — as ever. Beyond the warlord and clan fighting, there is now a budding conflict with Western aid workers. The Bush administration has said that terrorists with Al Qaeda are hiding in Somalia, sheltered by local Islamists, and has gone after them with American airstrikes. But a recent American attack on an Islamist leader in Dusa Marreb, a town in the center of the drought zone, has spawned a wave of revenge threats against Western aid workers. The United Nations and private aid organizations say it is now too dangerous to expand their life-saving work in Dusa Marreb. Ethiopian officials declined comment and have denied human rights abuses in the Ogaden. All across this region, one of the poorest of the poor, people are left to the mercies of the desert. In central Somalia, for instance, fewer than five inches of rain have fallen in the past year and a half, aid officials say. The winds are harsh, throats are dry. This area, like much of the Horn of Africa, is too arid for farming. The people here, in lonely outposts like Dagaari, survive by grazing goats, sheep, cattle and camels, selling the animals for money they use to buy food. “But nobody wants a skinny goat,” explained Abdul Kadir Nur, a herder in Dagaari. That was about all he had left after the drought killed 400 of his 450 animals. Not far from the pile of goat bones is a circle of stones. It is the grave of his toddler son. He walked a few more steps, his flip-flops digging into the crunchy earth. He arrived at Ms. Safia’s hut, where several people were peering in the doorway, watching her sweat on the dirt floor. The nearest hospital was only a half hour away, but nobody had any money to pay for a ride. “She will most likely die,” an elder said and walked away. Ms. Safia’s son seemed to sense that. He curled up next to his mother while he still could, his face pressed against the damp cloth that covered her. Her ribs moved up and down, up and down, in quick shallow breaths.